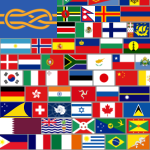 The PMDCI’s Flag Pack is a collection of flag icons for all country and regions identified by the ISO 3166-1 specification which can be used by application developers and web designers under the Creative Commons license to represent country and regions in their applications and sites. Applications and websites can use these icons to reflect the country or region selected by the user in order to enrich the user interface. For instance, social websites can use these flag icons to represent the location of their users in their user profile, members list and so on. Correct flags: I have been studying flags since the age of four, and I have seen several mistakes around. My goal with this flag pack is to provide a definite pack that follows the ISO 3166-1 specification (having said that, users should feel free to change/replace icons upon usage if they disagree with a representation). Constantly updated: I plan keep the flag pack up-to-date to follow any changes in the ISO 3166-1 specification, and official changes in national flags. Correct scales: All flag icons in this pack are PNG files with 16 pixels in height, with the width of each individual icon matching their correct scale as per the official flag. PMDCI’s Flag Pack is licensed under a Creative Commons Attribution-NoDerivs 3.0 Unported License.